Fishamble is an Olivier Award-winning, internationally acclaimed Irish theatre company, which discovers, develops and produces new work, across a range of scales. In 2018 Fishamble celebrated 30 years of new plays in Ireland through its many productions and extensive development programme. ​Fishamble is at the heart of new writing for theatre in Ireland, typically supporting 60% of the writers of all new plays produced on the island of Ireland every year. Fishamble has told the story of Ireland over 30 years through daring new plays and award-winning productions. Awards for Fishamble productions include Olivier, Scotsman Fringe First, Herald Angel, Argus Angel, 1st Irish, The Stage, Adelaide Fringe Best Theatre, Dublin Fringe, Forbes’ Best Theater, Stage Raw LA, and Irish Times Theatre awards, as well as Irish Writer’s Guild/ZeBBie and Stewart Parker Trust awards for many of its playwrights. During 2013, to celebrate the company’s 25th birthday, Fishamble donated its living archive to the National Library of Ireland. Fishamble is committed to touring throughout Ireland and internationally, and does so through partnerships and collaborations with a large network of venues, festivals, and non-arts organisations. Fishamble has earned a reputation as ‘a global brand with international theatrical presence’ (Irish Times), ‘forward-thinking Fishamble’ (New York Times), ‘acclaimed Irish company’ (Scotsman) and ‘excellent Fishamble…Ireland’s terrific Fishamble’ (Guardian) through touring its productions to audiences in Ireland as well as to England, Scotland, Wales, France, Germany, Iceland, Croatia, Belgium, Czech Republic, Switzerland, Bulgaria, Romania, Serbia, Turkey, Finland, USA, Canada, New Zealand and Australia. Fishamble typically produces over 200 performances in approximately 50 venues annually, touring from Ballydehob to Brisbane. 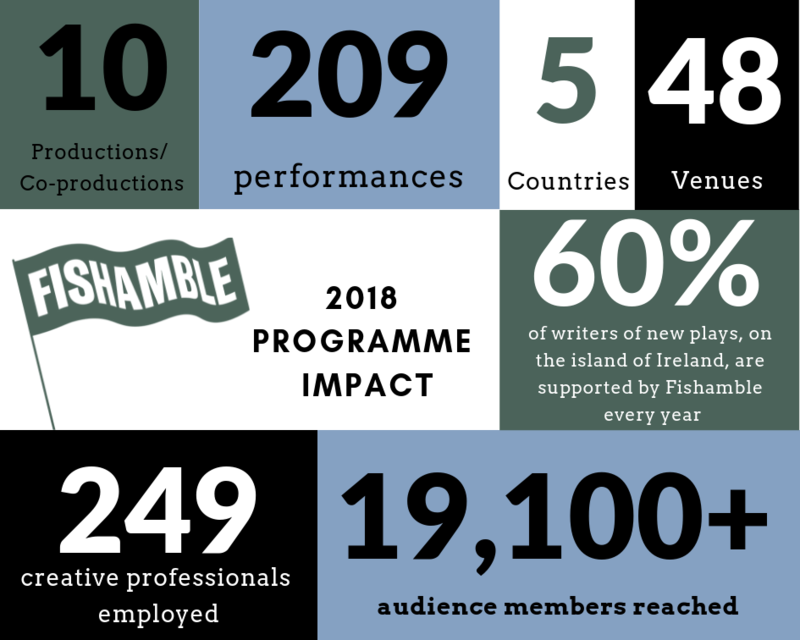 Fishamble continues to collaborate in meaningful ways with venues and festivals throughout Ireland and internationally, to reach audiences and help its productions and activities of various scales to reach their full potential. Current and recent partners include Business to Arts, Dublin Fringe Festival, Irish Theatre Institute, Abbey Theatre, Irish Arts Center, The Kennedy Center, Galway International Arts Centre, CoisCéim, Crash Ensemble, Centre Culturel Irlandais, Project Arts Centre, Odyssey Theatre LA, and Soho Theatre, as well as many venues and festivals throughout Ireland. Fishamble continues to work with UCD as Theatre Company-in-Residence, and the company and staff continue to work with students at NUI Maynooth, the Lir, TCD, GSA, Uversity and NUIG. The National Library of Ireland hosts Fishamble’s living Archive, which is updated regularly to accommodate students and others who are studying the work of the company. Fishamble is to be congratulated on bringing original material to the public. It is ploughing a risky furrow to produce fresh, innovative and modern Irish writing for the theatre. I wish the company continuing success. A truly alive company like Fishamble puts electricity into the National grid of dreams. a global brand with international theatrical presence. excellent Fishamble… Ireland’s terrific Fishamble. ​Ireland’s leading new writing company. ​Jim Culleton’s work with new playwrights at Fishamble has detonated a controlled explosion of fresh talent. The Dublin-based Fishamble company is only rarely in New York, and when they are, you’ve got to go. We would all be very much poorer without the stories Fishamble have to tell.